The former problem is one of cultural change and outside of the gambit of a technical functionality discussion. The latter problem however is one where product vendors can directly help to find solutions. And need to if their tools are going to see widespread adoption. 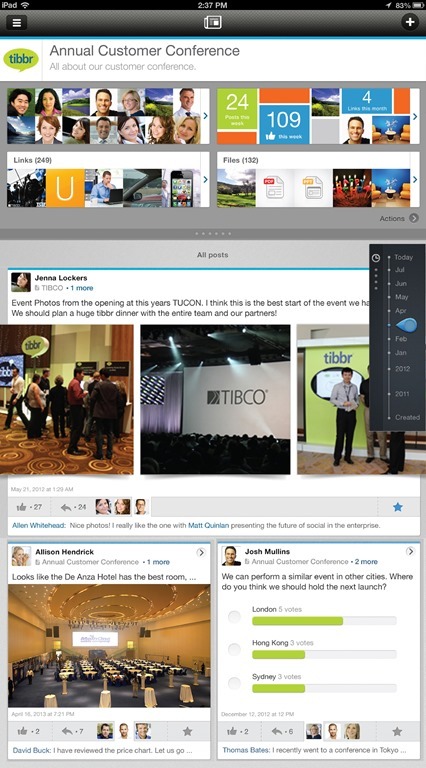 Which is why its very interesting to see the latest version of Tibbr, the enterprise social streaming product from Tibco, being released. In this version Tibco has focused on three of the most important barriers to the efficacy of social streaming: integrations, discovery of content and accessibility. The last leg of the three is the easiest to talk about – Tibbr is now available on all the platforms of note (iOS and Android) as well as the platform that most people write off, but lots of enterprises still use, BlackBerry. Now with that piece of less-than-exciting news out of the way, it’s time to get on to the interesting stuff. In this release, Tibco has focused hard on surfacing the right content by building in lots of behind the scenes tools to make the correct content more discoverable. The company has worked on algorithms which take into account the content a particular user tends to look at, their social graph and other factors, to surface content within what they’re calling a “Discovery Panel” – kind of a trending and contextual content window within the application. Next up is something that is really compelling, and what is indeed the future of enterprise applications. Tibco has opened up the Tibbr APIs and allowed people to build integrations with other enterprise applications of record. In this way users can both surface enterprise information within the social application but, more importantly, can take actions within the Tibbr application itself. Say you have an expense item from oracle – that can be surfaced and approved within Tibbr. Within the new application, Tibbr has an interesting way of enabling this. Users see the message (ie, “your Oracle system is presenting a new expense to approve”). When clicking on the particular message, the panel is flipped over and an action window is shown – users can take the action they need (approve, decline etc) and this is changed within the original system of record. I’ve long opined that the real promise of cloud, or SaaS and of enterprise APIs is the ability to integrate applications – not just in a traditional EDI sense of the word, but in a truly contextual manner. This latest version of Tibbr delivers on that vision – I’m looking forward to seeing stories of smart integrations people are building on top of the platform. tibbr is a really great enterprise social network. My company has been working with tibbr to build out task management and social performance management. It’s pretty clear from this vantage point that this type of platform is unbelievably powerful.